The Eta Corvi System is located about 59.4 light-years (ly) from our Sun, Sol. Eta Corvi is the star (12:32:4.2:-16:11:45.6, ICRS 2000.0) of Constellation Corvus (the Crow) -- just slightly northeast of Algorab (Delta Corvi), and farther northeast of Gienah (Gamma Corvi), Minkar (Epsilon Corvi), and Alchiba (Alpha Corvi); north of Kraz (Beta Corvi) and M63 (the Sunflower Galaxy; northwest of Spica (Alpha Virginis); slightly southwest of Porrima (Gamma Virginis); and slightly southeast of Zaniah (Eta Virginis). In 2005, astronomers discussed dust belts around this bright star (Wyatt et al, 2005). On October 19, 2011, astronomers using NASA's Spitzer Space Telescope announced finding evidence that a giant comet may have recently collided with a rocky planet around the star (NASA / Spitzer news release; Lisse et al, 2011a and 2011b; and Lisa Grossman, New Scientist, October 19, 2011). the outer edge of its habitable zone (more). Unlike Sol, Eta Corvi is a white-yellow main sequence dwarf star of spectral and luminosity type F2 V (Gray et al, 2006), that has been classed as white as F0 but is probably not yet a subgiant of luminosity type IV. This relatively large star has about 1.4 times Sol's mass (derived a interpolation table for NASA Exoplanet Archive from David F. Gray, 1992; and and Lisse et al, 2011b) and about 1.5 to 1.6 times its diameter (Lisse et al, 2011b; and derivation using a power law formula for the NASA Exoplanet Archive from Kenneth R. Lang, 1980). Compared to Sol, moreover, Eta Corvi is hotter with a theoretical bolometric luminosity about 3.7 to 4.9 times Sol's (derived using an exponential formula for the NASA Exoplanet Archive from Kenneth R. Lang, 1980; and Lisse et al, 2011b). With a fast rotational period of 1.33 days and "approximately Solar metallicity", the star has been estimated to be around 1.4 +/- 0.3 billion years old based on stellar type, rotation rate, metallicity, and x-ray activity) (Lisse et al, 2011a and 2011b; Casagrande et al, 2011; and NASA / Spitzer news release; Nordstrom et al, 2004; and Emeritus Professor Jim Kaler's Stars page on Eta Corvi at the University of Illinois' Department of Astronomy). According to Emeritus Professor Jim Kaler's Stars page on Eta Corvi (at the University of Illinois' Department of Astronomy), the star also exhibits some X-ray emission from magnetic activity. The star's outstanding characteristic, however, is that it appears to be a "Vega-type" star with a circumstellar dust disk that may hold at least two planets (whose presence has only been deduced indirectly). Eta Corvi is probably a Delta Sculti-type variable star with tiny spectral wavelength shifts that thought to be caused by "Delta Scuti" type pulsational variability. In addition to its New Suspect Variable (NSV) designation of NSV 5790, some other useful names and star catalogue numbers include: 8 Crv, Eta Crv, Gl 471.2, HR 4775, Woolley 9411, Hip 61174, HD 109085, BD-15 3489, SAO 157345, and LTT 4755. According to one type of model calculations performed for the NASA Exoplanet Archive, the inner edge of Eta Corvi's habitable zone is located relatively far from the star at around 1.514 AUs from the star, while the outer edge lies even farther out at around 3.028 AUs. The distance from Eta Corvi where an Earth-type planet would be "comfortable" with liquid water is centered around 2.141 AUs (about the middle of the main asteriod belt in the Solar System between Mars and Jupiter), where its orbit period would be around 2.62 years long. If there is life on any Earth-type planet orbiting Eta Corvi, it is likely to be primitive single-cell bacteria under major bombardment by meteorites and comets as Earth was for the first few billion years. If oxygen-producing microbes have not yet had time to develop and generate free oxygen in the atmosphere of such a planet, it probably would not have an ozone layer (O3) although Eta Corvi puts out more ultraviolet radiation than Sol. Zodiacal dust has been detected around Eta Corvi Lisse et al, 2011a and 2011b. 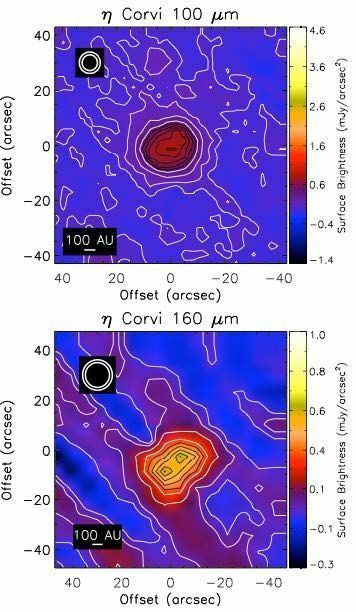 A circumstellar ring of relatively warm (350 K, 77 C, and 171 F), water- and carbon-rich dust was detected within 3 AUs of Eta Corvi in 2004 (Lisse et al, 2011a and 2011b; and Wyatt et al, 2004). The dust has a total mass of a large Centaur or medium-sized Edgeworth-Kuiper Belt object. This inner ring also contains "a fraction of amorphous silica from impact processes" (Millan-Gabet et al, 2011). 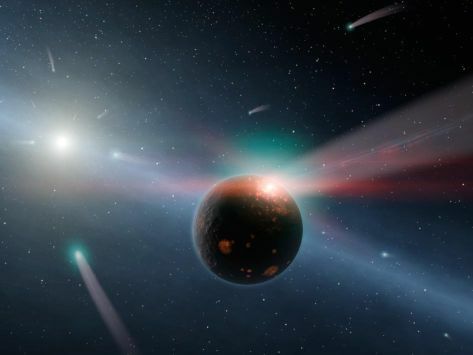 On October 19, 2011, astronomers using NASA's Spitzer Space Telescope announced evidence that a giant comet may have recently collided with a planet around the star (NASA / Spitzer news release; Lisse et al, 2011a and 2011b; and Lisa Grossman, New Scientist, October 19, 2011). A second, more massive ring of colder dust (of around three Earth-Moon masses at ~35 K, -238 C, or -396 F) extends to the far edge of the Eta Corvi system and is presumed to be the result of collisions in a reservoir of cometary bodies. This bright ring, discovered in 2005, looms at about 150 +/-20 AUs of Eta Corvi (Chen et al, 2006; and Wyatt et al, 2004). Some astronomers believe that a cometary body may have collided with a rocky planet in the inner ring of dust after it was perturbed from its orbit in the outer system by a giant planet at around 115 AUs (which would have an orbital 3:2 resonance with the cold dust at 150 AUs (Lisse et al, 2011). Our Solar System has a similar region, known as the Edgeworth-Kuiper Belt, where icy and rocky leftovers from planet formation linger. The new Spitzer data suggest that the Almahata Sitta meteorite may have originated in the Edgeworth-Kuiper Belt. On October 19, 2011, astronomers using NASA's Spitzer Space Telescope announced evidence that a giant comet may have recently collided with a planet "b" around the star (NASA / Spitzer news release; and Lisa Grossman, New Scientist, October 19, 2011). 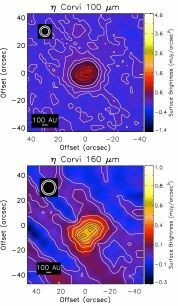 A second planet "c" may be shepherding the cold, outer ring of dust around Eta Corvi. Some astronomers believe that a cometary body may have collided with rocky planet "b" in the warm, inner ring of dust after it was perturbed from its outer orbit by a giant planet "c" at around 115 AUs (which would have an orbital 3:2 resonance with the cold dust at 150 AUs (Lisse et al, 2011). According to emeritus Professor Jim Kaler, Eta Corvi at the University of Illinois' Department of Astronomy, "The star was once thought to have a spectroscopic companion, but the tiny spectral wavelength shifts are much more likely to be caused by "Delta Scuti" type pulsational variability, which has not been researched (but which, given the spectral class, makes sense)." The following table includes all star systems known to be located within 10 light-years (ly), plus more bright stars within 10 to 20 ly, of Eta Corvi. Try Emeritus Professor Jim Kaler's Stars site for other information about Eta Corvi at the University of Illinois' Department of Astronomy. Up-to-date technical summaries on these stars can be found at: the Astronomiches Rechen-Institut at Heidelberg's ARICNS, the NASA Exoplanet Archive, and the SIMBAD Astronomical Database. Additional information may be available at Roger Wilcox's Internet Stellar Database. A small constellation in the southern sky, Corvus is Latin for raven or crow. One of the 48 constellations listed by Ptolemy, Corvus includes only 11 stars visible to the naked eye (brighter than magnitude 5.5). Associated with Apollo, the star pattern looks nothing like a bird, as the constellation was created because its stars lie near Constellation Hydra, whose snake pattern is associated with a fable about Apollo, written down by Ovid, which involved a watersnake, a crow, and a cup (which became Constellation Crater). For more information about the stars and objects in this constellation, go to Christine Kronberg's Corvus. For an illustration, see David Haworth's Corvus.